How would you like to chat with an author whose work you love? Well, your students definitely would, too! Setting up a classroom Author Chat seems like a daunting, impossible task, but I’m here to tell you that it’s TOTALLY POSSIBLE. With a little boldness, you can make your dreams for a classroom Author Chat a reality! Make connections and make a list. We are so lucky to be alive in this age of the internet and social media! 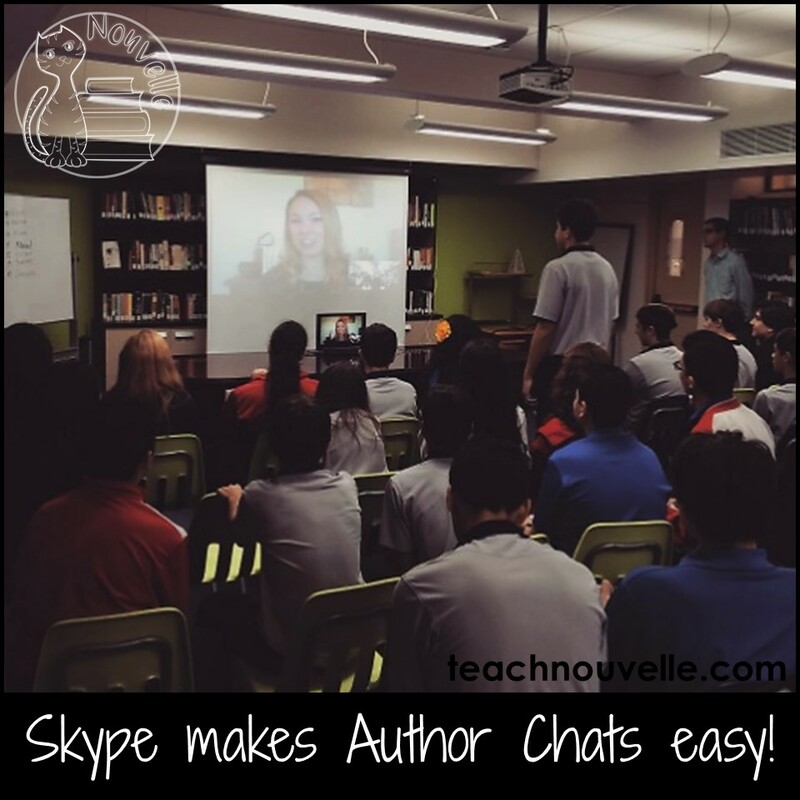 Your first step to an awesome classroom Author Chat is to embrace that. Whose books do you love? Which authors intrigue you as a reader? Reach out to them on social media! Many authors maintain Instagram and Twitter accounts, and there’s no reason for you not to interact with them there. Your goal is to develop yourself as a reader on these platforms, as well as developing a sense of who’s around and who’s available. You can even develop a relationship with authors on these platforms, but it’s not necessary (just nice!). Make a list of who you’d like to have do a classroom Author Chat. Both of mine were over Skype, so there was a lot less hassle involved (and they were free!). Some authors can charge for speaking gigs, so you may be able to convince your administration to let all of the students participate in the event to make this cost worthwhile. Once you know who you’d like to invite, you need to reach out to this person. Social media is the easiest way, but some authors may request that you work with their publisher to book them. When you write the email, go ahead and suggest a few possible dates and times. This will make it much more likely that a busy author will be able to pencil you in, instead of letting your message fall to the wayside. Set up your time and prep your students. 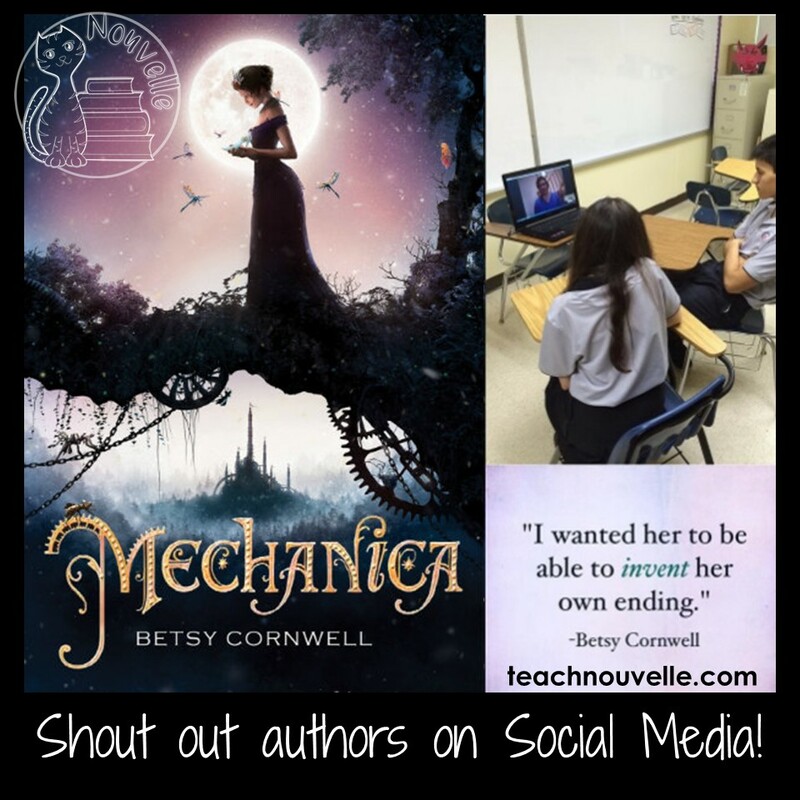 When you set up a time for your classroom Author Chat, you also need to prepare your students. Before we spoke with Suzanne Young, I was able to tell the students who chose her book in lit circles to brainstorm questions they could ask her. 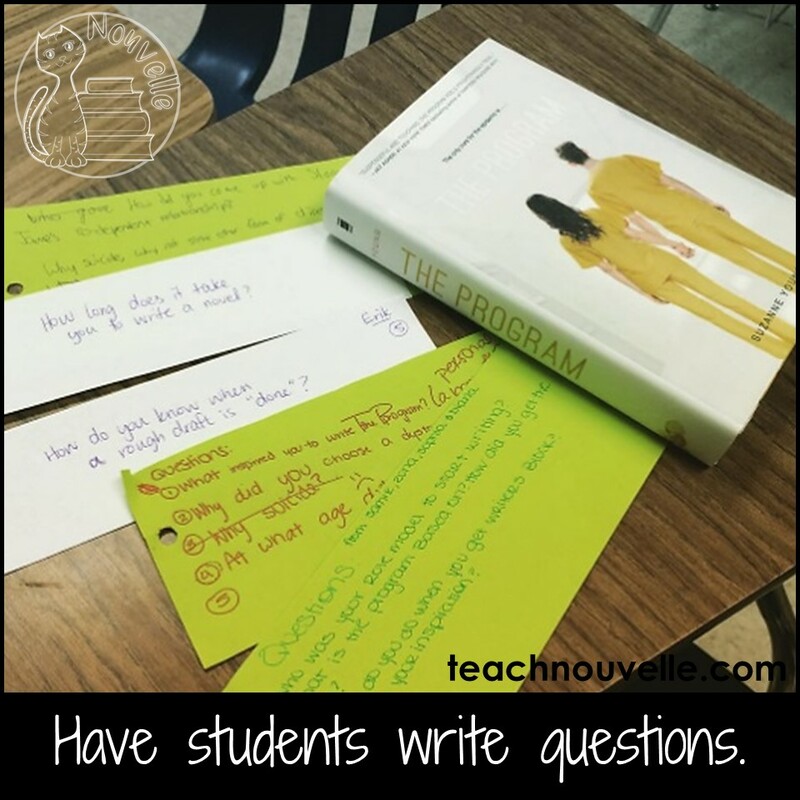 About three days before the chat, I had all of my students work with this group to come up with questions. At that point, my class was [working on writing short stories], so the questions were varied. Some students chose to ask her about her books, some chose to focus on the writer’s craft. I did ‘vet’ my questions, and selected the students ahead of time who would ask questions. We had a free portion at the end of the Author Chat (and yes, they asked her about her favorite TV show! ), but making sure that some core ideas got discussed was important for me to know that we’d used the time well. The day before a classroom Author Chat, I always test my technology. Consider: how far away will your students be sitting? How will they hear the author? How will the author hear them? Also, what will the author see on his or her end of the chat? With Betsy Cornwell, we were able to have our chat in the classroom with one computer. I had a very small class, so the set up was much less of a concern. Suzanne Young spoke to the entire ninth grade, however, so we projected the Skype chat on a screen, and used a microphone to make sure she could hear the students. We set up the computer so that it could see the whole room, so that she felt like she was talking to her full audience. Lastly, have a great chat! I’m always surprised at the buzz of energy before a chat – I’m excited, the students are excited, and other teachers in the school ask to drop in. It’s an amazing in-school field trip for students, so you can expect higher engagement and participation. When your classroom Author Chat is over, be sure to follow up with a thank-you card. Have all of your students sign one card, and send it to the author via their publisher. Everyone loves mail! I also co-authored a post with Sara from secondarysara.com about Six Guest Speakers for the ELA Classroom. Be sure to check that out!